I'm down to 24,497 pictures, which is a total of 311 pictures deleted this week. Better than my goal of 250, but much less than the 752 from last week. I stuck with 2012 this week. I'd planned to delete more organizing project pictures that didn't make it into blog posts. But being without power one night and without internet most of last week, kind of put a damper on that because I couldn't access my blog posts to see which pictures I used. So I turned to family pictures instead. I went through groups of pictures from special events and outings with the kids and chose to keep the best ones and delete ALL the rest. Like I shared last week, I get a little trigger happy with my camera sometimes, and I take way too many pictures.... just in case :) I end up with lots of pictures of more or less the same pose. Sometimes there's slightly different (and cute!) expressions on the kids' faces, but they are essentially the same picture. I pretty much figured if I wouldn't pay to print all the pictures, then why should I keep them. I was pretty ruthless. But now if I decide to print some pictures of vacations or birthdays or day trips, I only have to choose from a few special ones, rather than all the ones I had before. If you haven't finished purging your photos (like me!) I'd recommend doing that first. It's like when you're organizing a space in your house. You need to purge first, so you only need to organize what you're keeping. 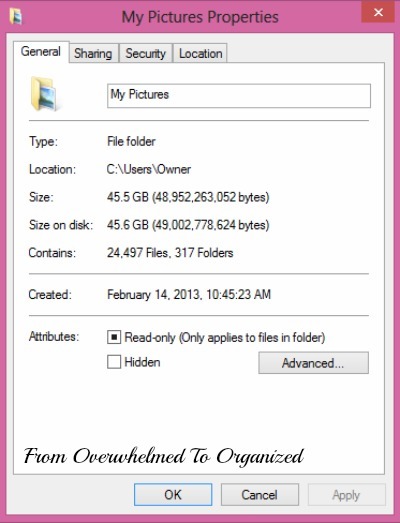 In this case, there's no sense organizing photos you're not going to keep! Once you have decluttered all your blurry, duplicate, and unnecessary photos, you're ready to organize the ones you're keeping. There are lots of ways to do this. Chronologically and by event are two of the most common. 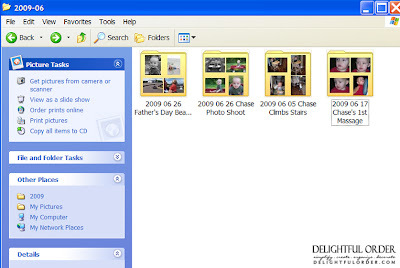 See the links below for examples of several different ways of organizing your pictures on your computer. You should choose whatever method makes the most sense to you, and that fits best with how you will most often search for your photos on your computer. If you have a great mind for dates, then chronologically may work well for you. 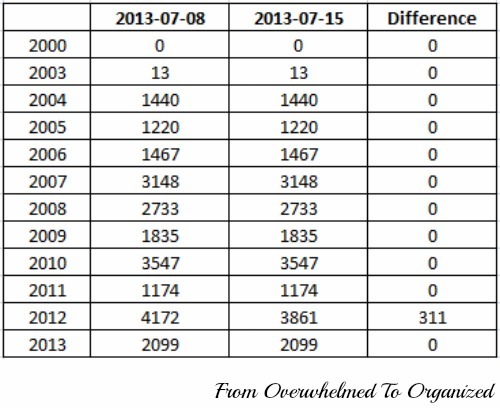 If you are better with people or places, then organizing by event may be easier for you. DaNita from Delightful Order shows how she organizes her photos by year, month, and then event within each month. She also shows her Photo Journal Log where she documents the events she photographed. 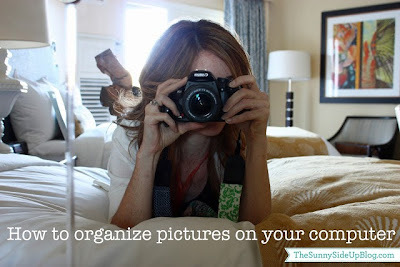 Erin from Sunny Side Up shares how she organizes her photos for her blog, as well as family photos she wants to keep but that don't make it into blog posts. If you have a system for keeping your digital photos organized and under control, please share your tips with us! 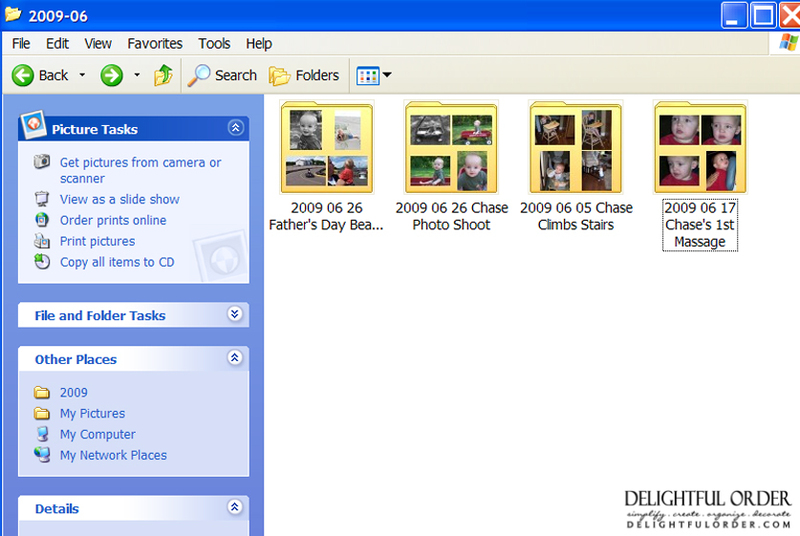 How do you organize your digital photos? Please comment if you're joining the challenge or share tips if you've got this digital pictures thing under control! My kids are the same way Skwishee! If you don't have time to purge all your old pictures, you can at least purge as you go from this point on, so they don't accumulate any further. Good luck!